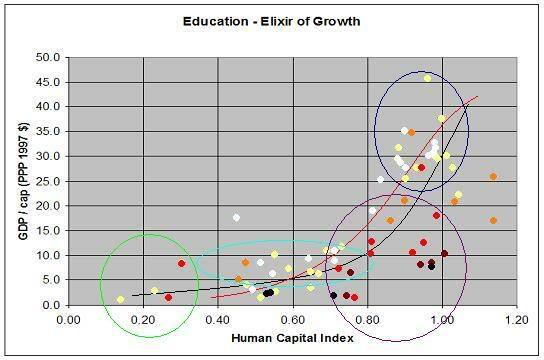 12 Comments to "Education as the Elixir of Growth"
Thank you for commenting. Do come again. Hello Stalker,first of all, I would like to thank you for the efforts you put in this blog. I’m Italian, and the MSM here in Italy are as russophobic as the english-language ones. 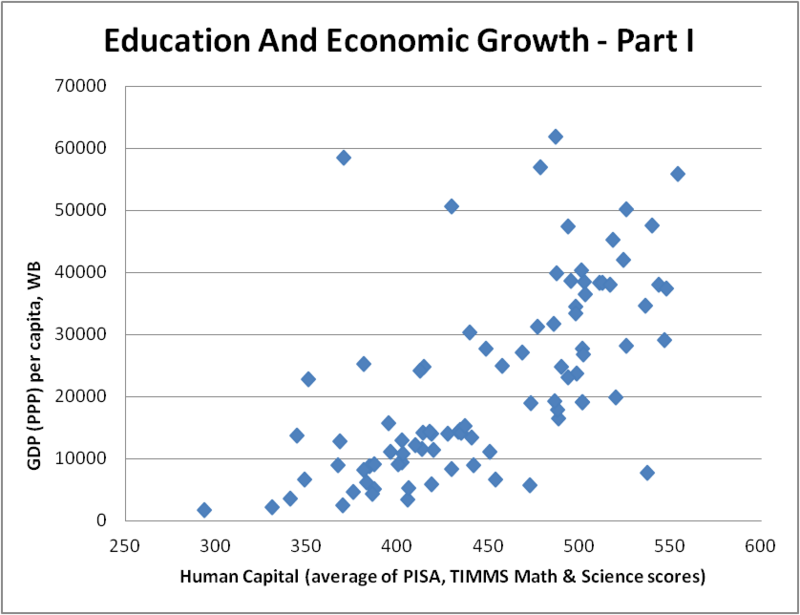 Although, to my knowledge, there are not obsessed russophobes like Mr. Lucas.Now about your post: I agree that education is very important for economic development but I have doubts on the value of the PISA surveys. AFAIK, the PISA tests are made by questions followed by 3 answer, and the student has to find the correct one. This is an evaluation method widely used in schools in some countries, but almost unknown in others. So the former countries will get higher scores than the latter.I think so because a student trained with PISA-like tests learns to select the right answer among the available ones; whereas many of the differently trained students will try to formulate an answer them self and only after will look for the best matching answer, thus losing time. In other and shorter words, the examination method is not neutral.Besides this, there are other critics on the PISA survey in the internet. Hello giuseppe,Thank you for the compliments. While I doubt blogs like these will convince many people, they do at least expose them to a different perspective. I am not surprised the Italian MSM is Russophobic, considering that Italians (like French and Spaniards) have an even lower opinion of Putin than the Brits. :)I have doubts on the value of the PISA surveys. AFAIK, the PISA tests are made by questions followed by 3 answer, and the student has to find the correct one. This is an evaluation method widely used in schools in some countries, but almost unknown in others. 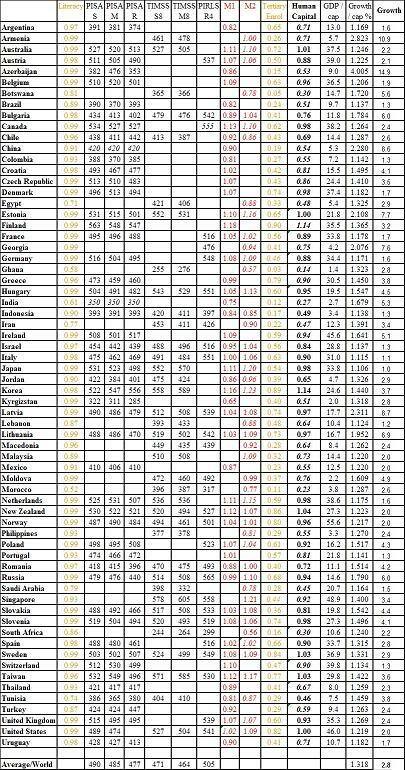 So the former countries will get higher scores than the latter.Not always. Here are the 2006 questions:http://www.pisa.oecd.org/document/25/0,3343,en_32252351_32235731_38709529_1_1_1_1,00.htmlAs you can see, while some questions do follow the multiple choice format, others require you to fill in tables or answer in conventional writing.No standardized test can be perfect at measuring academic ability, IQ, etc. I am forced to use the evidence that is available. As you can see, I also factor in the TIMSS and PIRLS for those countries that have them.The thing is that if I only relied on stats like years of schooling, tertiary enrolment and literacy rate then the position of countries like Argentina, Italy and Russia will be artificially inflated, in comparison to countries like Germany or Japan where not a particularly big % of the populations attends university, but where the quality of the secondary education is, according to the tests, is significantly higher than in Russia or Italy, not even talking about Argentina.Because whatever the faults of PISA, I think it’s safe to say that if your country lags another by 50 points or more, you’ve got a worse school system. It’s true that blogs won’t change the people’s ideas, at least not dramatically, but they are a good source of information. The problem with MSM is that, besides being partisan while pretending to be objective, are often superficial. For example, many “technical” newspaper articles about the internet and/or computers, even from major newspaper, are simply laughable. The last of these articles I read, from “La Repubblica”, confused computer viruses with exploit techniques.About the relation between education and development: I’m an assistant professor in engineering and I have been involved in several conferences in the past 12 years. I have met with researchers from many countries and I have noticed (and it was a surprise) that US researchers are almost all immigrants that took their grade in their home country (mostly China and European countries), i.e. they’re not US-educated. The few US-educated researchers working in US universities are old peoples in their fifties or sixties.So, although US schools are not very bad according to the PISA survey, the US education system seems to be unable to educate a local researcher class. This can be explained in two ways:1) There is something wrong with the PISA surveys.2) It’s the time lag between the surveys and the universities graduation. I mean that the schooling system has deteriorated but this effect hasn’t yet reached in full the universities.If 2) is true we can expect a “brain crisis” in many European countries shortly. Surely, this is the case for Italy. Thanks for your answer, it’s an interesting explanation.As for the article you linked, sorry but I don’t understand Russian language. Can you please summarize its content? @giuseppe,As for the article you linked, sorry but I don’t understand Russian language. Can you please summarize its content?Certainly. 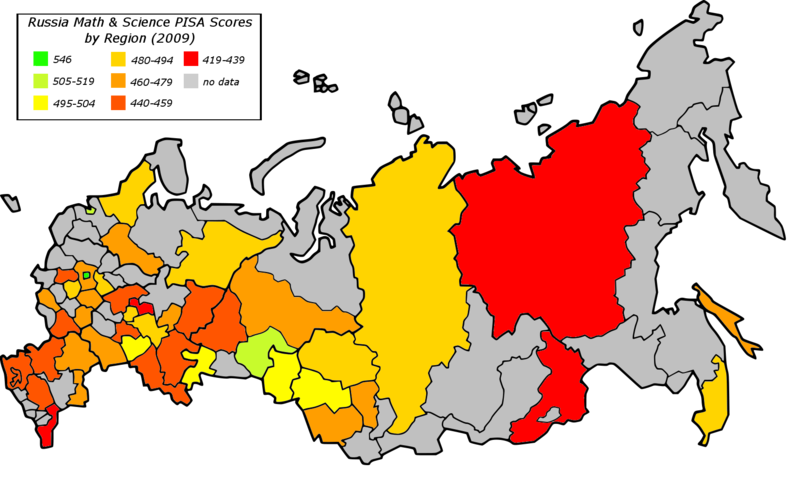 It outlines Russia’s spending/development plans for education to 2020. The main points are:1. Education spending to increase from 4.6% to 5.6% of GDP (the average in the G7 is 5.0%).2. Reform of universities to Western models (more tied in with the innovation economy).3. Bonuses for teachers to be tied with performance. State grants to higher education institutes with science and business sector links. Construction of 15 new university campuses.4. In 2013-17, the formation of 6-8 scientific-educational complexes of world stature is envisioned, rising to 10-12 from 2018-20.5. Creation of conditions for the participation of 20-25% of the labor force in improving their qualifications by 2013-17. Also focus on increasing the uptake of cadres into the system of professional education and increase the percentage of organizations and businesses offering in-house training programs to 20%. 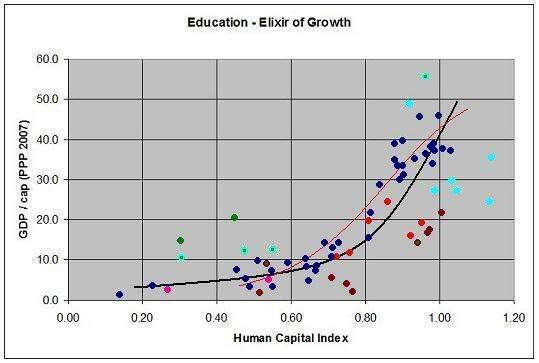 Something else that correlates well with GDP, growth in GDP, TIMMS scores, and the like is national average IQ. Lynn and Vanhanen have collected a lot of data from IQ test standardizations and other studies, which can fill in a lot of the missing pieces. Congrats on the successful move AK. But it seems that in the process the images for this article were lost. I’m not seeing them, though maybe it is the browser (Chrome).